Biographies of Plastic Artists, Non-Objective Art. Three-dimensional abstract art (aka non-representational, non-figurative, or non-objective art) comes in four basic types: geometric (which relies mainly on imagery made up of circles, squares, triangles, rectangles etc. ); organic (employing biomorphic or other imagery derived from nature); junk objects (comprising urban or domestic refuse); or semi-abstract (consisting of highly expressionistic, but natural images). Here is a list of the top 70 abstract sculptors, together with their key works. French sculptor, member of Puteaux group and the Section d'Or group of Cubist artists. Best known for his Cubist/Futurist works. 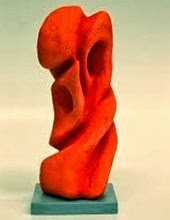 Romanian abstract sculptor, active in Paris. One of the great early exponents of non-objective art. Pioneer of direct carving; emphasized 'shape'. Exhibited at the Armory Show. French fauvist painter, printmaker, designer, sculptor. Controversial American-born English sculptor, associate of Picasso and Modigliani, joined Vorticists. Also known for his sculpture of Oscar Wilde's tomb in Pere Lachaise cemetery. Spanish figurative and abstract artist, founder of Cubism. Equally gifted at painting and sculpting. Leading member of the Italian Futurism movement; wrote the Manifesto of Futurist Sculpture in 1912. German architect, designer & sculptor; founder of the Bauhaus Design School. Russian-born French sculptor, brother of Naum Gabo, pioneer of Constructivist concrete art. Ukraine-born Russian painter, designer, sculptor; founder of Constructivism. French sculptor, printmaker, designer; trained as a stonemason; friend of Braque, Juan Gris, Fernand Leger and Picasso. One of the first to apply Cubist principles to sculpture. Belgian painter, sculptor, exponent of non-figurative art; member of De Stijl and Abstraction-Creation. Ukrainian-born Russian sculptor, studied in Paris; introduced to Cubism by Leger. Exemplified Cubism's new way of depicting three-dimensional forms. German-French sculptor and painter; founder member of Abstraction-Creation, known for his signature organic abstraction, in bronze, metal and marble. French experimental artist, Father of modern art, pioneer of Dada and avant-garde sculpture, notably his "ready-mades". Controversial exhibitor at the New York Armory Show. American painter and sculptor; wife of Alfred Stieglitz; pioneer of abstract modernism in USA. Ukrainian-born Russian experimental painter and sculptor. Best known for his unique junk art (sculpture) in the Cubist style. Moved to Paris, 1925. Arrested by Gestapo, died in a concentration camp. Swiss painter, designer, Bauhaus teacher and sculptor, best known for his geometric abstraction. Swiss designer, Dada artist, Bauhaus follower, wife of Jean Arp, one of the pioneers of concrete art. Russian-born French sculptor, friend of Archipenko, Brancusi, Jacques Lipchitz and Picasso. Best known for his expressionistic style of Cubism. American avant-garde painter, sculptor, designer and photographer. Founded New York's Dada movement with Marcel Duchamp and Francis Picabia. Later joined the Surrealist movement. Best known for his photography, notably his "Rayographs". Russian pioneer of 20th century kinetic sculpture, younger brother of Antoine Pevsner; one of the most influential exponents of Constructivism. Russian sculptor, painter, industrial designer; influenced by Suprematism; leading exponent of Constructivist non-figurative sculpture. Coined the term "non-objective art". Lithuanian-born artist, friend of Picasso, Modigliani and Matisse; influenced also by African art; became one of the foremost Cubist sculptors. Active in Paris (1909-40), thereafter in America. German-born painter, sculptor, printmaker and collage artist. Major figure in both Dada and Surrealism. Married the American millionairess art collector Peggy Guggenheim. Long-lived Spanish Surrealist abstract painter, turned to sculpture in 1944 (in terracotta, clay, and bronze). With Henry Moore and Barbara Hepworth (both known for their organic abstract sculptures) he was one of the most influential exponents of geometrical concrete art in Britain. Member of St Ives School, and editor of Circle, a collective manifesto of abstract art, published in London, 1937. Leading Hungarian Constructivist painter, sculptor, designer; Bauhaus instructor. Considered to be the most outstanding female Polish sculptor of the first half of the 20th century, she is best known for her early Cubist-style nudes and abstract kinetic forms hanging in space. American pioneer of kinetic art; inventor of sculpture "mobiles" made from wire and pieces of wood. His skill was to convert arrays of ordinary materials into abstract universes. The greatest British sculptor of the 20th century, in bronze or stone. Best known for his biomorphic abstracts and his organic forms in reclining poses. See also: Modern British Sculpture 1930-70. Russian Constructivist artist, member of the Obmokhu group (Society of Young Artists), pupils of Tatlin and Rodchenko at the Vkhutemas Higher Technical-Artistic School in Moscow. Had his work illustrated in Circle - the 1937 collective manifesto of abstract art, published in London. Russian-born American sculptor, famous for her abstract painted wooden assemblage art. Swiss sculptor noted for his "existentialist" figurative and semi-abstract art, as well as his avant-garde Surrealist abstract sculpture. Avant-garde French naif artist, collector of Art Brut (Outsider Art), known for his sculptures constructed from junk materials. Highly influential British sculptor noted for her organic abstracts. With Henry Moore and Ben Nicholson, the most important figure in the development of 20th century British abstract sculpture. One of the great American abstract painters, best known for his Colour Field Painting, he also created this sculptural masterpiece. New York abstract painter/sculptor. Absorbed Cubism before settling on the Neo-Plasticism and De Stijl style of geometric abstraction. Greatly undervalued until shortly before his death, he was eventually judged to be one of the great abstract sculptors of the mid-20th century. See also: American Sculptors. Arguably the most original American sculptor of the pre-war generation, best known for his abstract sculptures ("3-D metal calligraphy") made from a variety of metals and junk materials. American artist, best known for his coloured geometric relief sculptures, which he called 'structurist'. Swiss ex-Bauhaus architect, sculptor and designer. Follower of De Stijl and Abstract-Creation group. Long-lived American abstract sculptor, best known for her 'spider' structures. - Here I Am, Here I Stay (1990, Galerie Karsten Greve, Cologne. American architect and sculptor; a former architectural apprentice to the great Frank Lloyd Wright (1867-1959); Associated with abstract expressionists like Jackson Pollock, Barnett Newman, Rothko and Clyfford Still. Only began exhibiting from 1964. Devoted to non-figurative art, he is known for large-scale geometric sculptures. Polish-born Irish artist, noted for her large free flowing stainless steel abstract public sculptures, including 'Freedom' (Bank of Ireland, Computer Center Dublin), and 'Phoenix' (University of Limerick). Influenced by Surrealism, especially by Rene Magritte and Yves Tanguy. Became one of the most important twentieth-century exponents of kinetic or moving sculpture. Venezuelan sculptor, kinetic artist, active in Paris. His "Vibration Structures" in 1958 helped to establish his international reputation. American painter, sculptor and printmaker; switched to abstract art in the late 1940s, due to his fascination with stained glass windows. Influenced by Constructivism, he adjusted to abstract expressionism and shaped canvas. His sculpture mirrors his painted forms. British sculptor, one of the founders of British Pop-Art. Best known for his large scale abstracts. One of the most influential and innovative abstract sculptors in post-war British art. Abstract expressionist artist who applied action-painting techniques to the art of sculpture. Noted for his wrought-iron linear works and monumental public sculptures. American painter, sculptor, multi-media artist, pioneer of Pop-Art, renowned for his "Combines", collages and assemblages. The following combine is made from painting, cloth, metal, leather, electric fixture, cable, oil paint, and board. Greek experimental artist, pioneer of kinetic sculpture. Swiss sculptor, kinetic artist, husband of Niki de Saint-Phalle. Tinguely was the leading exponent of self-destructing (auto-destructive) junk art. Leading figure of American minimalism, very highly rated by the legendary British collector of contemporary art, Charles Saatchi; pares his sculpture to the minimum material, shape and colour; best known for his series of 'stacks' and 'specific objects'. American abstract sculptor and conceptual artist. A leading exponent of Minimalist concrete art, he is best known for his geometrical skeletal structures. - Open Geometric Structure IV (1990) Painted wood, Lisson Gallery, London. Irish semi-abstract sculptor, after Alberto Giacometti, best known for his bronze King & Queen sold at auction in 2009 for €190,000, a world record for Irish sculpture. 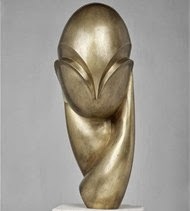 Works in the Brancusi tradition; uses sculpture to promote spiritual contemplation. American painter, sculptor, performance artist and art theorist. Became a leading exemplar of Minimalism, and abstract experimental sculpture. American postmodernist creator of sculptures made from fluorescent lights. American sculptor, a leading exponent of public large scale iron/steel sculptures. American minimalist sculptor noted for his simple geometric compositions made out of industrial materials like stainless steel. Minimalist American sculptor best known for his geometric concrete art. See also: 20th Century Sculptors. German-American painter and sculptor, a pupil at Yale under Josef Albers. Achieved rapid recognition as an exponent of Eccentric Abstraction. English pop artist, noted for his suggestive sculptures. American postmodernist artist, former pupil of ex-Bauhaus teacher Joseph Albers. World famous for his monumental public works constructed from Cor-Ten steel and other industrial materials. - Tilted Arc (1981, Federal Office Plaza, New York) - The Matter of Time (2004, Guggenheim Bilbao). American contemporary artist, noted for his monumental sculptures and New Image Painting. India-born British abstract sculptor, winner of the Turner Prize, famous for his monumental works in rough hewn stone, cast metal and stainless steel.